How can sellers prevent that? Have lots of interesting items, photographed well. On every item page, eight of your items are displayed to the right (from your shop section). Fourmore are on the top right, your most recently listed items. Make sure everything has enticing, clickable photos. Style your photos for your target market. Write compelling item descriptions. Tell a story. Do it in the way that your target audience prefers. Make your product listing descriptions appealing to the buyers who are searching for them. Another way to keep buyers in your shop is to provide a link lead at the bottom of every listing. Most websites try to keep you in their store by linking you to an attractive gallery of similar items. On a page with an animal item, I present a link to other animal items. On a listing with sterling silver brooches, I show other brooches. You could show more art deco items on a deco piece, more mid-century modern items for that style. "See more great baby shower gifts here." Whatever items you have that might be of interest a shopper for that particular item. Sometimes I use two or three lines (farmhouse, bedding and boho for example) if the item for sale fits those genres. This method requires careful attention to tags. It works best if your items that will be presented together have a similar look, make an attractive collection. Think... treasuries! I put mine at the bottom of each listing. They can go anywhere within your listing text, though. If you think that a buyer might not finish reading the listing and move on, try placing your back links higher in the listing. "Grab" them, prevent them from bouncing out. 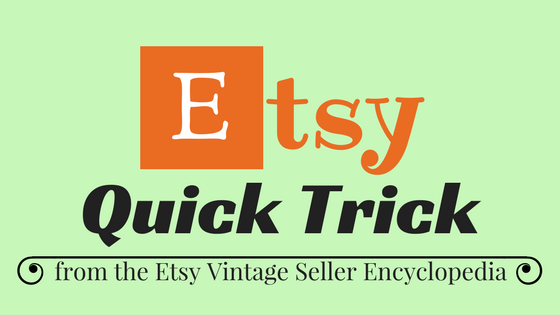 According to Etsy admin, these back links do not affect rankings in Etsy search. Tip: when making the link to your similar shop items, be sure that you you are in the public, customer-facing shop view, not your shop manager view. Tip: use short links from a site like Bit.ly to streamline (and track) your link. Joanne, as always, helpful and easy to do. Thank you!! !